Caption slip reads: "Photographer: Emery. Date: 1958-02-23. Reporter: Driscoll. Assignment: Mrs. Taubman appointment. Special instructions: Hold for release attn city desk. 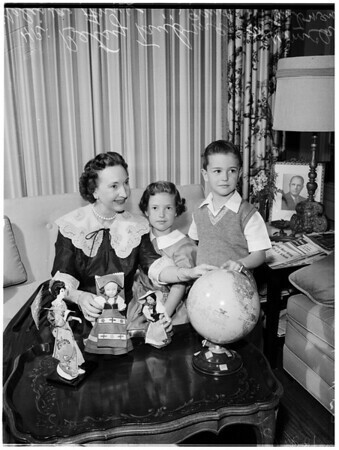 16/30: Betsy Taubman (Mrs. George P. Taubman, Junior) at home 1429 La Perla Avenue, Long Beach, with visitors, her grandchildren Melissa Anne Taubman, 9 years, and William Clare Taubman, 5 years. 22/23: Betsy Taubman".